To say this week didn't go as planned is a total understatement! Thanks to a surprise dental surgery, I wasn't able to be quite as creative as I wanted to be in the kitchen. 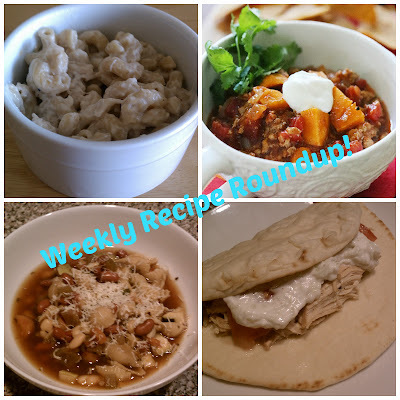 Thankfully that particular unforseen event took place late in the week, so I still have 4 fantastic recipes to share with you. I don't know what the weather is like in your particular corner of the world, but it's been insanely unpredictable here. As I write this, it is currently 25 degrees and extremely blustery outside. However, just a few days ago, I had my daughter outside in shirt-sleeves enjoying the 70 degree sunshine! My solution for weather like that is cooking a couple meals in the crockpot. It's a great way to balance hearty meals for warmth and perfect for those unexpectedly warm days where you want to avoid having the oven turned on. This week I cooked a 2 dinners in the crockpot: a soup and a chicken dish. I'm really utilizing it this year and am loving what a timesaver it can be. What are some of your favorite crockpot dishes? The first recipe I want to share with you is the one I didn't create in the crockpot. I got the idea from a few posts I came across on Pinterest and made it my own. Thanks to my older sister's culinary prowess, I already knew how to make a simple cream sauce and I used that as the basis for this customizable stovetop mac & cheese. It was a huge hit in our house and I plan on making it again, maybe utilizing some buffalo chicken flavors, adding shredded chicken and a few shakes of hot sauce and bleu cheese crumbles to the cream sauce. That's what I love about recipes like this, you can make them your own! This next recipe is a new spin on a hearty chili. We love chilis in my house and this one was incredibly simple and flavorful. Plus, it's a great way to use seasonal veggies like sweet potatoes or you can easily swap in butternut squash to use here too! It's also such a simple recipe, I could successfully assemble it even though I had 12 stitches in my mouth and was on percocet. How hard could it be? It is no secret to anyone who reads this blog that my husband is a soup fanatic. I have to admit that over the years he's turned me into one too. I have a standby minestrone soup I make on top of the stove, but I stumbled upon this one and became intrigued by the possibility of cooking it in a crockpot. It was perfect and I honestly don't think I'll go back to cooking it on top of the stove anytime soon! This final recipe is one I know I'll be making again. Too often I fall into the rut of thinking that the only thing I can cook in a crockpot are soups, stews and chilis. This recipe for gyros completely blows that kind of thinking out of the water. I used chicken, but you could easily substitute beef or lamb. Just watch the cooking time and make sure the meat doesn't dry out! Well, that's it for this week. Next week is Thanksgiving, the big kahuna! What are your standby dishes? I'll do a post-Thanksgiving post of what I cooked this year and a big thank-you to everyone who has voted in the dessert poll this year. We decided on Pumpkin Cheesecake for dessert and I can't wait to share that recipe with you next week!